2016 Membership Available Now - Fight On Forever! Home > Blog > 2016 Membership Available Now - Fight On Forever! Panthers Membership is NOW ON SALE! The excitement for season 2016 is already building and we hope you join us to "Fight On Forever" as we chase ultimate success! No matter where you live, locally, over the hill, interstate or overseas, or if you're a junior or senior supporter, we want to see everyone proudly wearing our famous Blue and White in 2016. 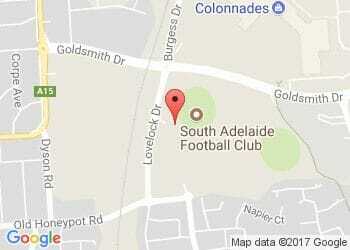 When you renew or join as a Panthers Member you become part of the South Adelaide family. You also receive a range of Member benefits, including discounts on food and drink at Jimmy Deane's and Club merchandise, as well as an exclusive Members pack filled with goodies and much more! There are plenty of exciting incentives to sign up as a Panthers Member in 2016. Check out the following great features of 2016 Panthers Membership below! Brad Gotch has signed on as Senior Coach for a further two years, dual Magarey Medallist, Joel Cross is returning in 2016, as are skipper Brad Crabb and the majority of the team. Couple that with our exciting recruits and there is a thrilling sense of enthusiasm around our team heading into 2016! You don't need to worry about price hikes in 2016. ALL Panthers Memberships have been capped at 2015 pricing! Gone are the days of rummaging through your wallet or purse to manage a separate gate ticket and Members Card! In season 2016 the SANFL is introducing electronic tickets, which will merge your gate ticket and Member Card into one and allows you to scan in at the gate! Say goodbye to generic, tacky, hole-punched cardboard tickets and say hello to your new personalised barcoded ticket with a cool Panthers graphic on the front! Are you a first year member? Do you live interstate? Or just unsure how many Panthers games you can attend in 2016? According to our 2015 Supporter Survey the second most popular reason for becoming a Panthers Member was knowing you are supporting the growth of grassroots football. The Grassroots Membership Pack is perfect for those who want to show their support for the Panthers and contribute to growth of their Club, but can't commit to attending 10-18 games a year. Grassroots Members receive all the merchandise and benefits of becoming a member without the added cost of admission to games. Thanks to the feedback from our 2015 Supporter Survey, the in-demand Members badge and bumper stickers will be making a triumphant return to ALL Membership Packs in 2016. Meanwhile, classics such as caps, scarfs, Panthers News will all be padding Member Packs and player cards, drink bottles and mini footys are sure to keep a smile on the faces of our Junior Members. You can purchase Panthers Membership online by clicking here and following the prompts.